The Best Soup blogs from thousands of top Soup blogs in our index using search and social metrics. Data will be refreshed once a week. About Blog Favorite soup Recipes from Real Kitchens Everywhere! Facebook fans n/a. Twitter followers 18,800. Newport Beach, CA About Blog Just a Taste offers a wide variety of quick, easy and impressive soup recipes for any occasion, plus step-by-step photographs and cooking videos. Facebook fans 1,660,007. Twitter followers 10,962. About Blog Quick/easy Soups for the everyday home cook. Facebook fans 235,589. Twitter followers 13,475. Saint Paul, MN About Blog A food blog with hundreds of simple and tasty soup recipes. Facebook fans 290,256. Twitter followers 13,715. Denver, CO About Blog Real Food. Real Soup. Real Life. Real Simple. PaleOMG was created to inspire, make you smile, and change your meals for the better. Facebook fans 356,371. Twitter followers 28,761. About Blog A great place to find easy, delicious and family friendly soup recipes. Facebook fans 2,296,598. Twitter followers 8,212. About Blog A subreddit dedicated to the best form of food known to humanity! Soup! Facebook fans 1,158,177. Twitter followers 517,182. About Blog Pretty Darn Delicious Soup Recipes. Quick to make recipes with a select few easily available or on hand ingredients that promise big flavor everyone will love. Facebook fans 608,836. Twitter followers 1,503. About Blog A recipe blog featuring fun and easy modern comfort, delicious photography and the occasional soups. Facebook fans 28,728. Twitter followers 7,936. Washington, DC About Blog A Korean mom's home cooking worldclass Soup recipes. Facebook fans 18,869. Twitter followers 660. Pennsylvania, USA About Blog Bringing people together at the table for delicious soup, food and great conversation. Facebook fans 60,032. Twitter followers 2,509. About Blog Cassy Joy's real food, a talented hand in the kitchen, and her mission to empower others to make their own health transformations soups. Facebook fans 27,396. Twitter followers 1,385. Dallas, Texas About Blog Two sisters giving you the dish about their soup recipes. Facebook fans 3,470. Twitter followers 139. Reno, NV About Blog Dishing up Progressively Paleo Soup Recipes. Facebook fans 7,191. Twitter followers 1,846. Lafayette, Louisiana About Blog Acadiana Table's mission is to preserve and promote Louisiana's rich Cajun and Creole foodways. George Graham's stories and photographs capture the best soup recipes. Facebook fans 9,689. Twitter followers 309. USA About Blog Portuguese restaurant and food guide for all the soup lovers. Facebook fans 25,135. Twitter followers 256. Toronto About Blog Primal Gourmet is your source for delicious and free Paleo, Whole 30 and Gluten Free soup recipes. Facebook fans 4,277. Twitter followers 94. Old Oakland About Blog Ratto's is your friendly neighborhood deli and market, family owned and operated since 1897 which brings to you all the best soup recipes. Facebook fans 501. Twitter followers 43. About Blog My favorite healthy, real food soups & stews for busy families can be found below. All recipes are grain-free, dairy optional and kid-approved. Facebook fans 659,531. Twitter followers 28,662. New York, NY About Blog Juicing for Weight Loss and a Healthier Lifestyle with Joe Cross and his team. Find all time best soup recipes. Facebook fans 615,731. Twitter followers 29,897. About Blog eating soup alone is a post in which I post pictures of my sad, lonely soup dinners. Penang, Malaysia About Blog Cantonese soup recipes, Chinese herbs, Asian soup tips and a bit of Traditional Chinese Medicine. About Blog Soups n Broth is the page which brings to you all the delicious and healthy soup recipes. About Blog It's ramen time is one of the best soup blogs. 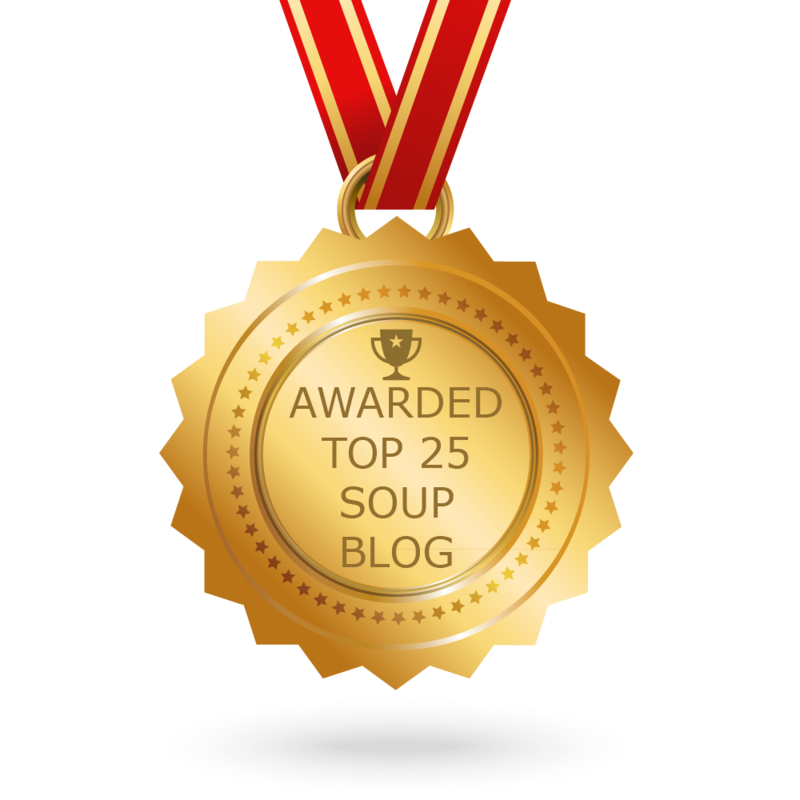 CONGRATULATIONS to every blogger that has made this Top Soup Blogs list! This is the most comprehensive list of best Soup blogs on the internet and I’m honoured to have you as part of this! I personally give you a high-five and want to thank you for your contribution to this world.